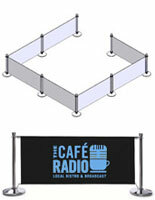 How do custom café barriers boost brand while controlling crowds? 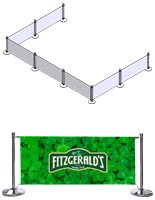 The answer to that question is simple. 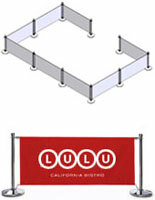 In addition to queuing lines and partitioning visitors for events, a screen hanging between two stanchion posts with a logo and tagline instantly boosts your brand. Close off a section of your dining establishment when it’s slow. 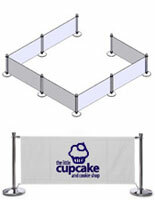 Or cordon off several areas at a convention hall for use by different vendors. 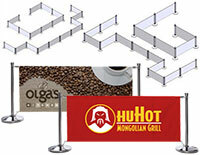 Visitors will spot graphics with an eye-catching imprint from across the venue, and be drawn into activities there. These outdoor banner systems will contain crowds at air shows, marathons, graduations, conferences, festivals, cafes, weddings, train stations, hotel lobbies, art shows, and more. 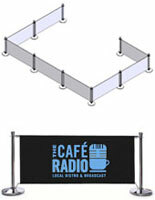 Customize signage by adding high quality printed images in bright or neutral colors with simple or ornate lettering heat transferred or digitally printed, depending on the occasion. 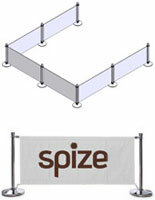 Polyester or woven mesh fabric withstands frequent use and provide a beautiful and durable backdrop. 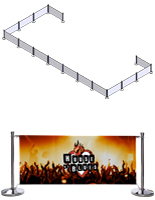 Each of these outdoor banner systems enhance marketing efforts effortlessly because they are easy to configure, set up, break down, and transport. Enhance marketing efforts while organizing guests with a pop of color and your tagline and logo heat transferred onto the fabric. 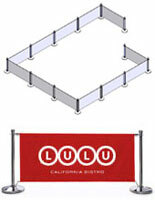 These custom café barriers, also known as windbreak stands for restaurant events, come in an array of weather-resistant styles, designs, and colors. 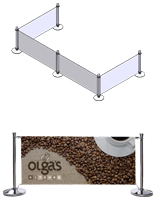 Depending on how many kits are used at the same time, these stanchion setups can queue lines or subtly create space for gathering, whether it's a business meeting, exhibit, or gala. Guests will not fail to notice why they are standing there -- graphics are attention-getting but in a way that isn't forced. 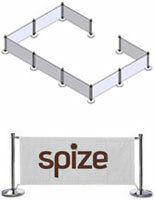 Partition off an area to set up a food court or smoking area in a mall or hotel. 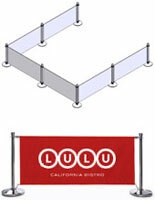 Keep congested areas flowing with custom café barriers with printed graphics in red, blue, black, and white. 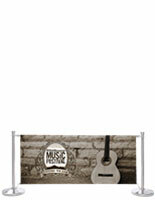 Full bleed dye sublimation will result in more complex designs that are worth the extra you'll spend. 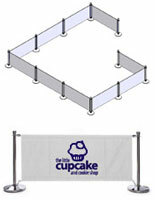 Options for images are available at different price points; from 2- or 3-color to full color dye-sublimations, there are an array of designs to choose from. 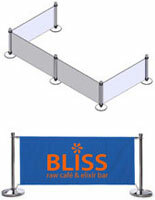 Choose single- or double-sided signage depending on the type of crowd, the desired printing method, and organizational budget. 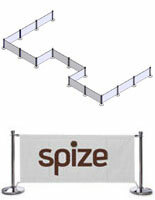 Configure numerous stations at a large-scale festival or create "dining rooms" outside for weddings at a country club. 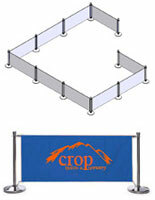 Train stations and airports are other places these particular stands can be used. 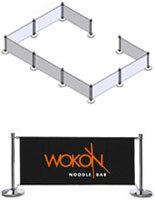 Digitally printed units tell prospective customers and guests who you are and what you sell, which is a great way to reinforce a company brand without spending extra money. 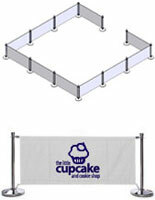 What attributes should I be looking for when purchasing outdoor banner systems for my company? 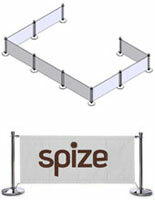 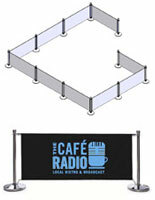 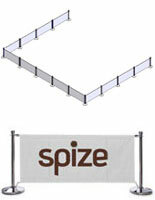 Whether your organization is a bank, or a festival, custom cafe barriers "handle" advertising while organizing crowds. Look for sturdy, portable stanchion posts with railbars in lightweight aluminum or steel; ABS plastic stanchion bases can be filled with water for extra stability. Caps can be screwed on to add water. 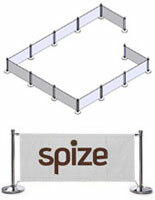 A small artisan booth requires fewer pieces than a trade show at a large convention hall; we supply any configuration from 1-16 screens. Single-sided or double-sided ... the latter will cost a little more, but that's twice the advertising. Printing options vary, but our informed customer service team is happy to walk you through those processes if you're not familiar. 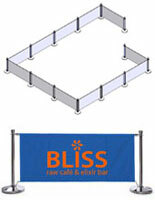 Use these crowd control fixtures as all-in-one directionals, brand boosters, and advertising plus the accessories - like tulip-shaped toppers - that add visual interest. 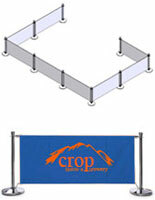 This online store offers everything needed for shaping and organizing droves of people or small crowds. 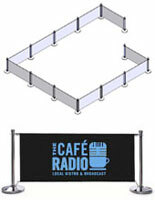 From singular screens held up by a stanchion on either side, to a multiple post configuration with an eye-catching imprint, there is something to suit every type of business and function. Customized messaging burns your organization and its purpose into the minds of visitors -- all with a subtle touch! 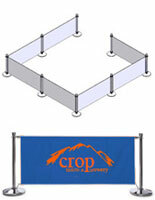 These weatherproof stands are great for creating memorable indoor and outside events. 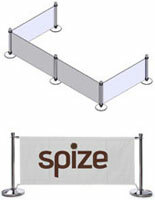 Shop hundreds of crowd barriers with printed graphics here at StanchionsDirect.com. Buy complementary market umbrellas elsewhere on this website to dress up and restaurant patio. 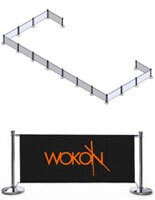 If you've landed here, you need not go anywhere else to create the parties and business functions of your dreams!